Welcome to the CurtainsDirect2U Blog. Unfortunately you can't leave comments on this page but if you would like to interact and comment on any of our subjects please visit www.curtainsdirect2u.blogspot.co.uk Any comments posted here will be updated to show on this page too. Thank you. We're happy to announce that for the next five weeks on the run up to Christmas we will be donating to 5 separate charities. This weeks charity is the RNLI to which we are donating £1000. I’m sure you’ll agree this is a very worthwhile cause and we would like to thank everyone for their custom and support over the last year. Without you this wouldn't be possible. So there you have it. For all you hayfever sufferers purchase some of our net curtains to help you beat hayfever! To help you out even more use the discount code 'hayfever' at checkout for 10% off your net curtain order valid until 1st August. We wish you the best of luck Jo from all at CurtainsDirect2U! We are giving away a SINGLE Pixel Duvet cover and pillowcase. This is a sample, so does not come in retail packaging. Simple rules - Go to our Facebook page www.facebook.com/CurtainsDirect2U "Like" our page and "like" the prize give-away post. Shares would be appreciated, but are not a requirement of entry. Name of winner will be drawn on the 4th June. Who is going to be the first person in the UK (and world!) to get their hands on this? Unless you've been hiding underneath a rock you've probably seen or read about the 'Blue & Black Dress'. Some people saw it as Blue & Black and some people saw it as White & Gold. The picture went viral and people were going crazy arguing what colour it was (including myself). What do you see? I saw White & Gold to begin with.... 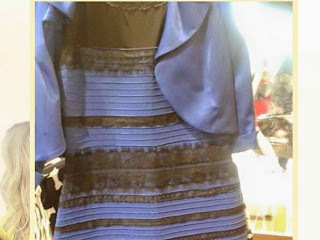 I was then told it was Blue & Black and when I went to look at the picture again it had 'changed' colour to blue and black. I was sure it was a trick and the person showing me had changed the picture but this was not the case. It made me think do we all see colours the same? This I don't know but what I do know for sure is peoples perception of a colour can be completely different! 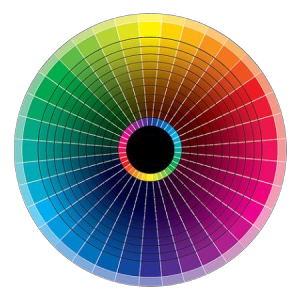 Whether it be blue, green, yellow or red everyone has a colour in their mind for each and they can be completely different shades from person to person. A popular colour we get comments on is purple. Some will call it lilac and some will call it aubergine. It can get confusing! Imagine the trouble with our grey voile panels we have since 50 shades of grey was released 'What shade of grey is it?'. This is a nice graphic of colour shades. What you need to understand when ordering online is that the name of the colour is just a name. Our red might be different from what you call red. For instance maybe when you hear red you think of a deep colour like burgundy? More often than not the pictures will help you determine what shade the colour is but please be aware computer monitors can display colours differently especially if you have different settings. Fortunately at CurtainsDirect2u we have an easy returns process if the colour was not as expected. We're happy to announce the new partnership with courier DPD. Customers can now receive the amazing customer service they provide like their notification texts and emails. 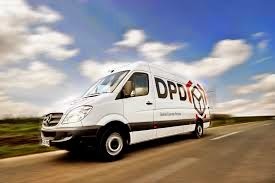 Provide us with your mobile number and select next day service and DPD will send you updates and an hour window of when your parcel is expected to be delivered. You can also see where the driver is on a map, update a safe place you would like your parcel left or choose a different delivery date. If you order on a Friday you can even pay them extra for a Saturday delivery. Having used DPD myself I'm very happy with the service they provide and hope you will be happy with them too. Lost Video Presentation Of John Aird & Co Ltd Now Found! What is curtain gather or fullness and how much gather / fullness do I need? This is a question we are asked quite a lot. If you’re new to purchasing curtains then you may not have heard the term ‘gather’ or ‘fullness’ before. Without gather the curtain would just be a flat piece of fabric across the window and not have the soft folds that are aesthetically pleasing. Having your curtain flat across the window is not good for a few reasons. 1. It looks bad. This should be reason enough not to do it. 2. The gather will help you obscure the view into your room. The more gather you have the more privacy you will get but don’t go ordering too much gather, if you have a patterned net curtain too much gather can obscure the pattern which could also make it look bad. We will cover this more a little later. 2. ‘Blockout’ and thermal curtains need to have gather when shut to be fully effective at blocking out sunlight and keeping your room well insulated in the winter. 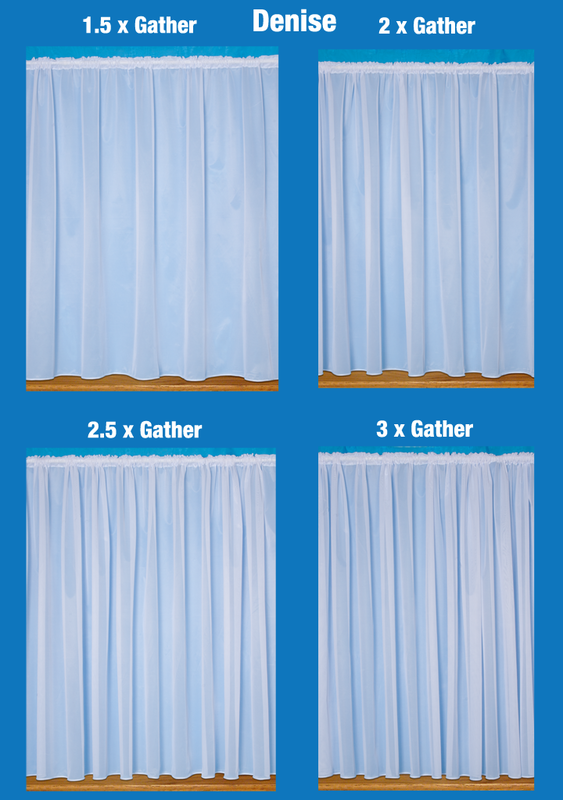 The normal amount of gather we recommend would be 2x the width of your window. This is a safe option and you can’t really go wrong with this amount of gather. Some people have a preference for more gather which is fine but if you have a patterned net curtain then 3x gather can obscure the pattern. With a plain curtain like our Denise net curtain 3x gather would be fine and something I personally like with a plain net. Below are some pictures showing the effects of different gather and may help you decide what amount of gather is right for you. When ordering readymade curtains you will normally see the dimensions shown as width then drop so 46”x72” would mean 46” width x 72” drop. This is the dimensions of each curtain and if you are buying them as a pair you will get two curtains with this dimension. This makes it easy to buy for your window because if your window is 46” wide you can purchase a 46” width curtain and you will automatically get 2x gather as you will receive two curtains at this width, which in essence doubles the width of your window. Readymade curtain will usually be sold in the following widths 46”, 66” and 90” so will accommodate most widths of windows. 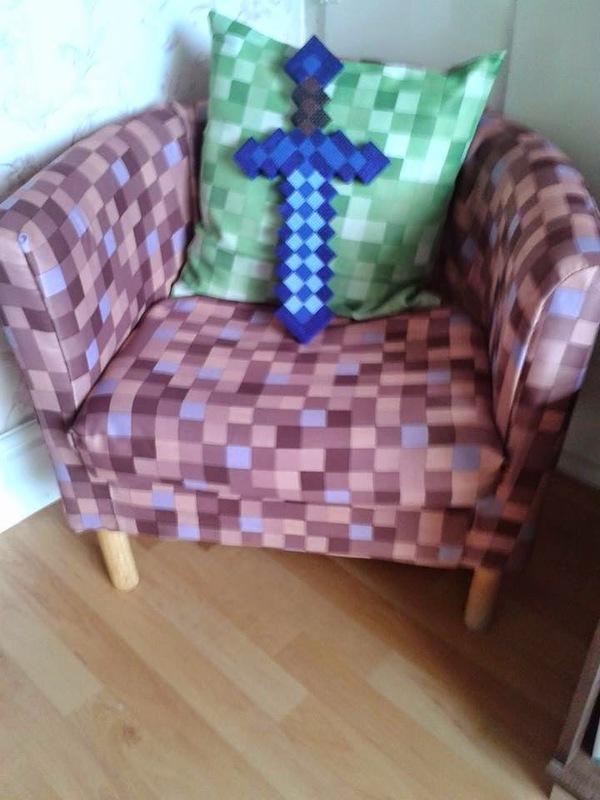 If you have kids there's a good chance you've heard of the game Minecraft. The game is extremely popular with kids and big kids alike and is a world wide phenomenon. The creator Markus Persson just recently sold the company to Microsoft for $2.5 Billion and has been in the news recently for outbidding Beyonce and Jay-Z for a home in LA paying a whopping $70 million for it! You can click here to see some pictures of this fantastic house. 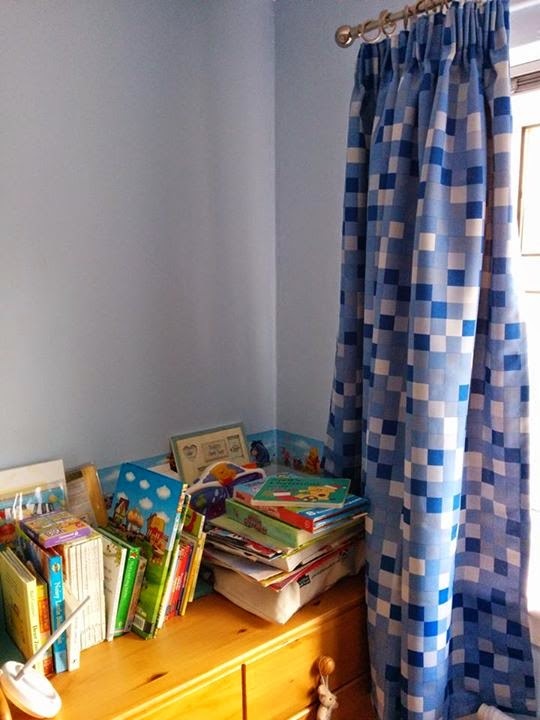 Anyway, kids like their bedroom to be decorated with a Minecraft theme (including my niece and nephew) so our 'Pixel' curtains and cushion covers have been perfect for this. 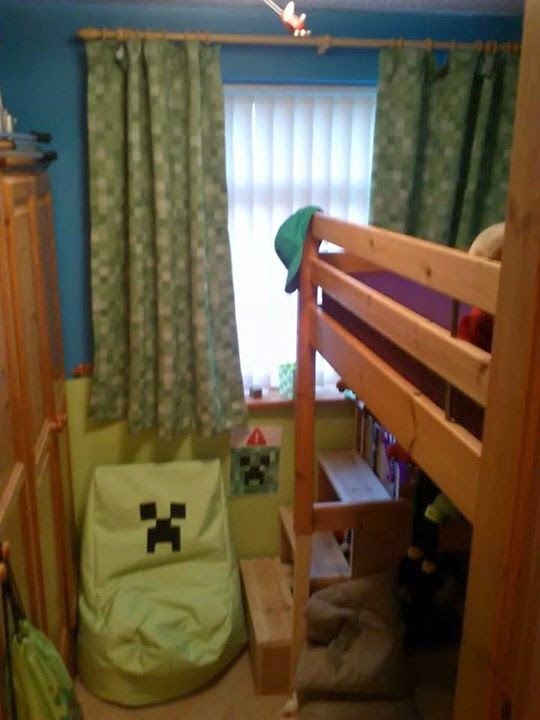 We've had a great response to them on our Facebook page with customers sending in pictures of their Minecraft themed bedroom to thank us for our Pixel blackout curtains and to show off their room creations. One customer went as far as buying the curtains for the fabric and using the fabric to make a chair cover. The result was very impressive as you can see. 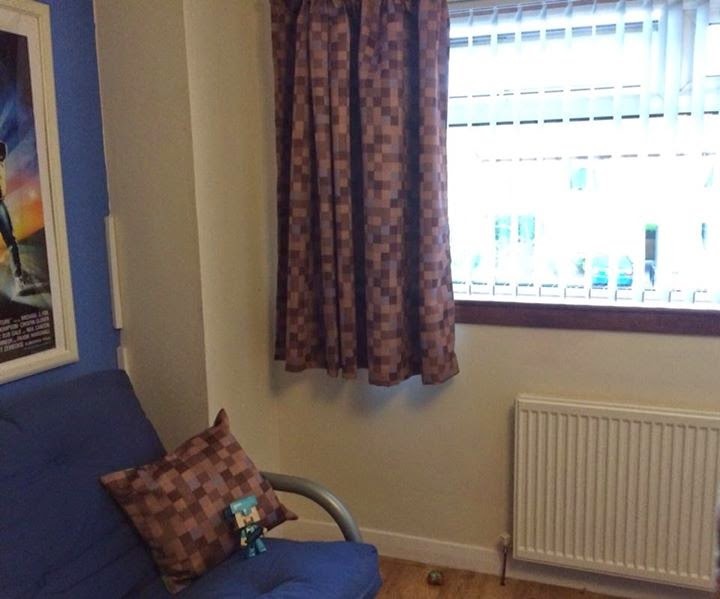 Here are some more pictures of Minecraft theme rooms people have posted to our Facebook page. Our curtains come in three colours. Blue, Brown and Green. We also decided a fun picture to document the feat was in order (See below). A year has passed and we are now deliberating again to decide what worth while cause will get the donation this year. We are only a small family run business but we hope we can grow our business and our charity contributions. Thank you to all our customers over the year for buying from us and making this possible. Hello and welcome to our new blog. My name is Andrew and I am one of the directors at curtainsdirect2u. Myself and some of my colleagues will hopefully be able to inspire and help you with all your textile needs and of course have some fun. To get us started I have inserted the picture of our history storyboard so you can get to know what we're all about a bit better. For instance our parent company John Aird & Co Ltd started way back in 1896! You may want to click on the picture so it displays in a larger size.